It's all about the money in this exciting puzzler. 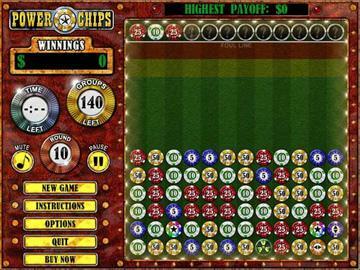 Eliminate matching chips from the screen and watch your winnings grow and grow! The more you collect, the more you win. Play the bonus chips for big, big bucks. Whether you're looking for a relaxing break, or a mad dash for the cash, this swinging game pays big! 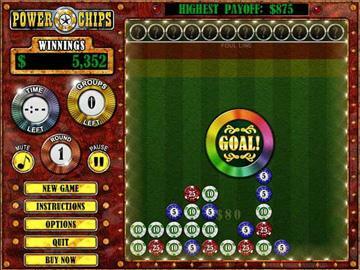 A puzzle game where you have to get rid of different combinations of three or more chips without changing their places. When you play games like this there are more than just a few benefits and not any of the free online games could bring such a edging experience to you. 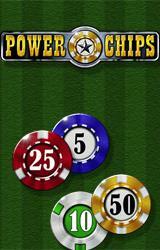 Enjoy rounds of the game as a new row of casino chips falls every few seconds keeping you on your toes. Make sure your pieces do not pile up to touch the top bar, else the game gets over. There are bonus chips with special powers that help you in the game. There are chips which are wild and can match colors, bonus or nuke chips get rid of all the surrounding chips. 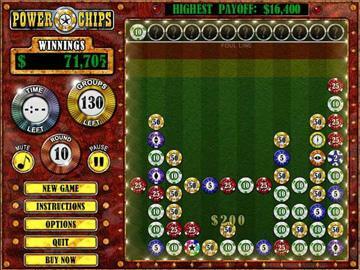 Power Chips can be played in two modes; normal and time attack. The normal mode as the name suggests is more suited for casual gamers while the timed mode is for experienced players who prefer playing with a timer set. Apart from the basic gameplay, there are plenty of fun mini games to be played. The graphics in the game are quite good and set against a gorgeous Vegas backdrop, it is a pleasure to play along as the chips keep falling down the board. The left side of the screen shows statistics such as time left and groups left. The sound effects are funky and upbeat, perfectly in tune with the theme of the game. An enjoyable game that can match up with many fun games with lots of fun levels packed with a number of possible moves with randomly generated dice falling downwards to fill the space vacated by matching dice you've just made disappear.